This is “what’s on my workbench” today. 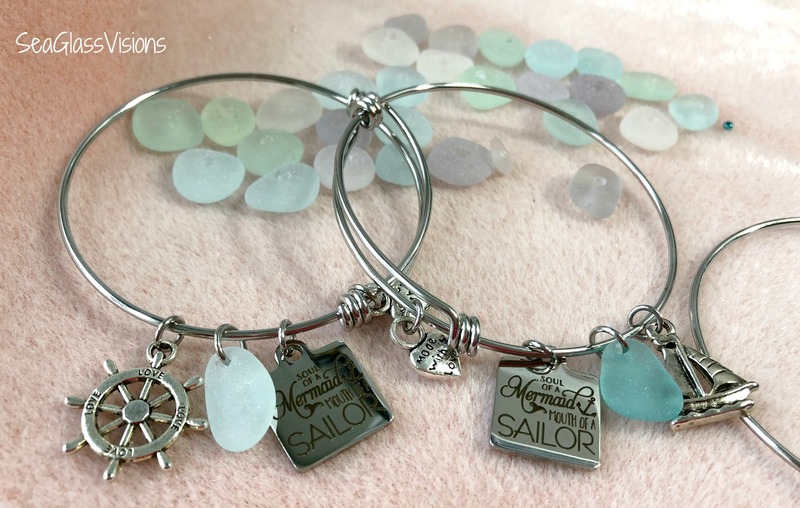 Adorable “Soul of a Mermaid~Mouth of a Sailor” charms on adjustable bracelets. These and other designs are also available in my Etsy Shop! They are created with jewelry quality California sea glass and high quality jewelry findings. 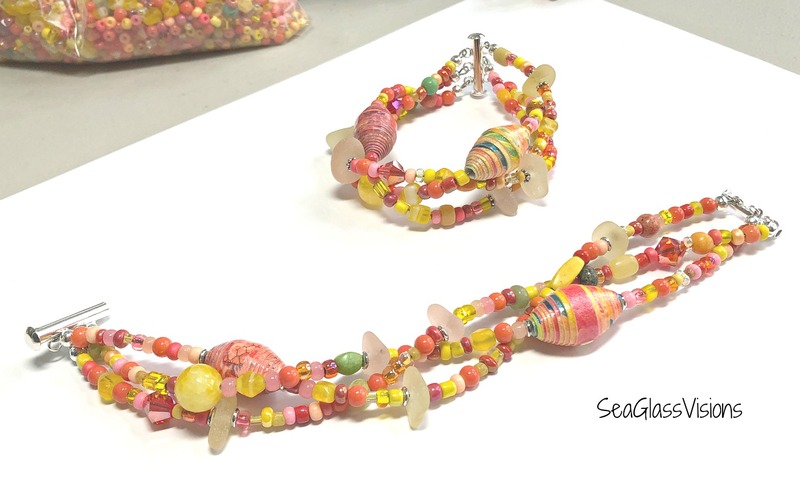 These are similar to my “Mermaid Soul” bracelet recently featured in Glassing Magazine, The Mermaid Issue, May/June 2018. First, let me say I don’t know where the time has gone since I last wrote in March. I had promised myself I’d write more often, but sadly haven’t kept that promise. The time seems to fly and I don’t know where it goes. I’m still creating both jewelry and art with sea glass (of course) and selling in my consignment shops. My Etsy shop is very well stocked and I have many new styles I plan to release as the summer weather gets warmer. The Bay Country Crafters Show was a success and I am looking forward to their Fall Show as I will introduce my sea glass snowflakes there for the first time! One BIG thing that has happened to me since writing in March is that I have a piece of my jewelry featured in Glassing Magazine! It is in the May/June 2018 issue, also known as “The Mermaid Issue”. 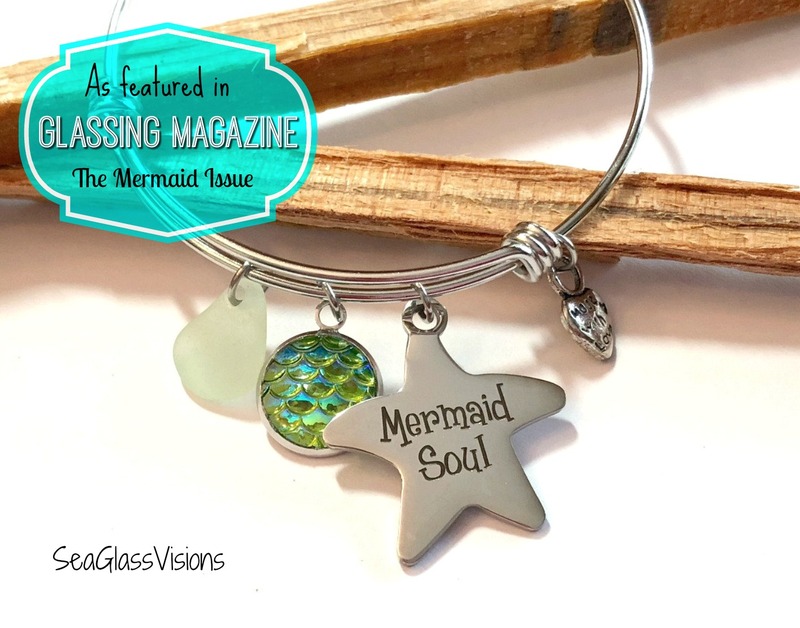 The editor, Rebecca Ruger-Wightman, wrote that she “was hoping I could include your fabulous mermaid bangle with the Mermaid Soul charm and sea glass in a page dedicated to Sea Glass Mermaid items and art.” What could I say! This beautiful adjustable bracelet, featuring a Mermaid Soul charm and light green UV sea glass that will glow under black light, is included, along with many other beautiful artisan creations, in a spotlight called, “Ode to a Mermaid – Sea Glass Style”. Needless to say I’m absolutely thrilled by this! I have a well established Etsy shop, which will be six years old this year! 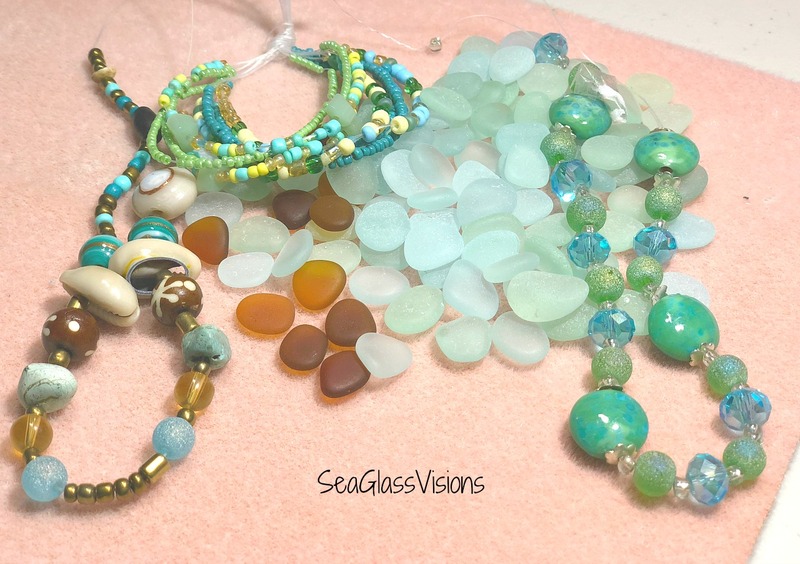 I have an active Facebook and Instagram presence as “Sea Glass Visions” and have sold hundreds and hundreds of pieces of jewelry and art over the years at a variety of art and craft shows. Over the past six years I’ve made a LOT of upgrades and changes in the quality of my sea glass, my designs and in the quality of jewelry components. Even from the first time I created a piece of jewelry six year ago, I have strived to improve my techniques and designs and I’m so proud, that even with a simple bangle bracelet, the decisions I have made have proved successful and are being recognized and honored in a BIG way in the sea glass community! And I couldn’t have been happier! 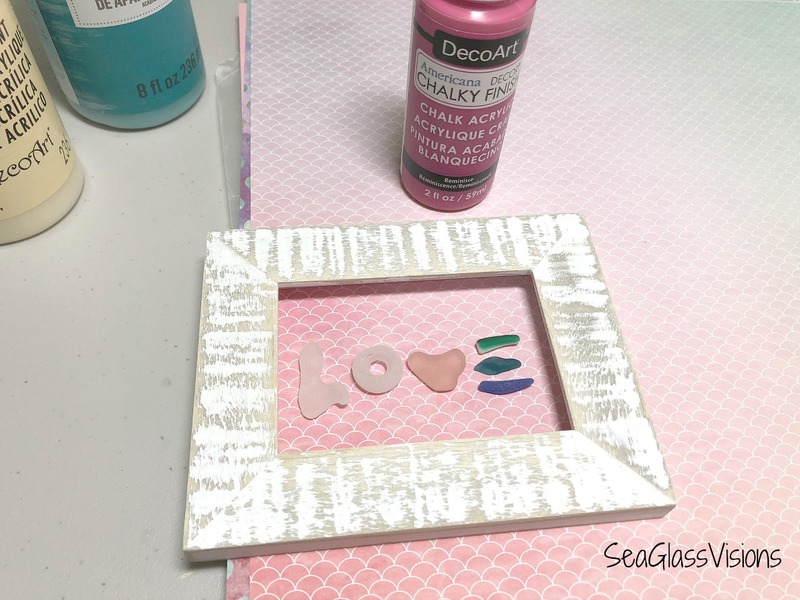 Not only did I change the paint color on the frame, I changed the sea glass “LOVE” letters too. That fabulous cobalt blue “o” is actually an old light bulb insulator. This is truly a one-of-a-kind piece. I posted this picture on my SeaGlassVisions Facebook page and had a purchase request within a few hours. HonestIy I wasn’t even sure I wanted to sell it, but the request came from someone who I have met, who has purchased jewelry from me, and who wanted it for her sister. How could I say no? And, we should always “share the love” in whatever form it takes. Things around my house have been quiet for the past few weeks so it’s been a good time for me to do my favorite thing, create with sea glass. I have an upcoming craft fair next month – The Bay Country Crafters Spring Marketplace. This fair is a big one, which I’ll need a lot of jewelry for. I am also going to offer art pieces at the fair. I have jewelry and art in two local artisan shops and like to change out my stock often to keep my offerings fresh and I want to update jewelry in my Etsy shop. 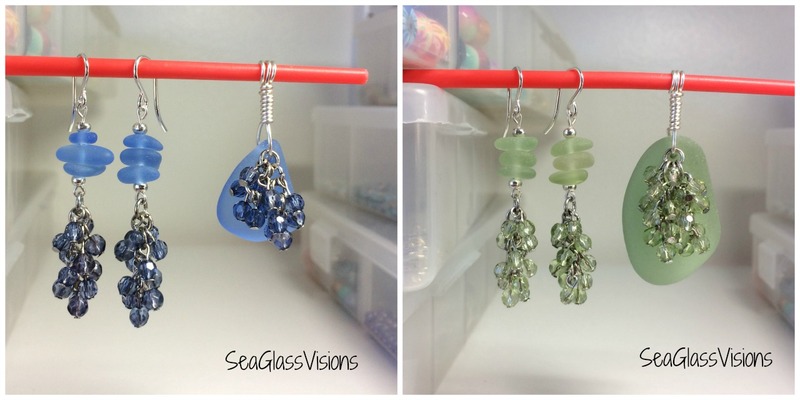 But the past few days I’ve put the jewelry aside to focus on creating sea glass art. I enjoy this change of pace, it actually is a welcome rest as it’s easier on my hands than creating jewelry. And, just like creating jewelry, there are always times when what was planned doesn’t work as planned and becomes something even better. This is how it was with this frame. At first I thought I’d color wash it with the bright fuchsia color. Well, it was a bit too bright, actually much brighter than I thought and wasn’t going to work at all. I wasn’t sure what to do, I thought I might have to start over. Then I figured I’d try to tone down the color. 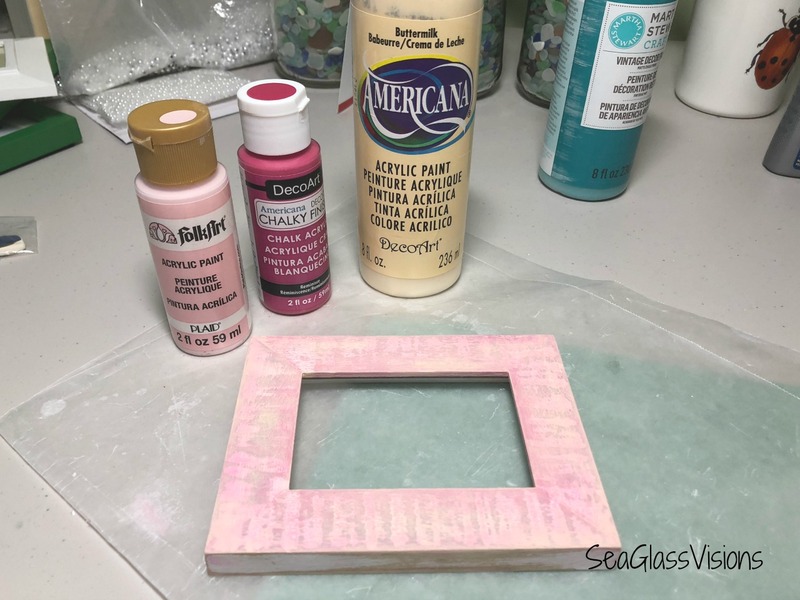 So I added a buttermilk and pastel pink and loved the result. 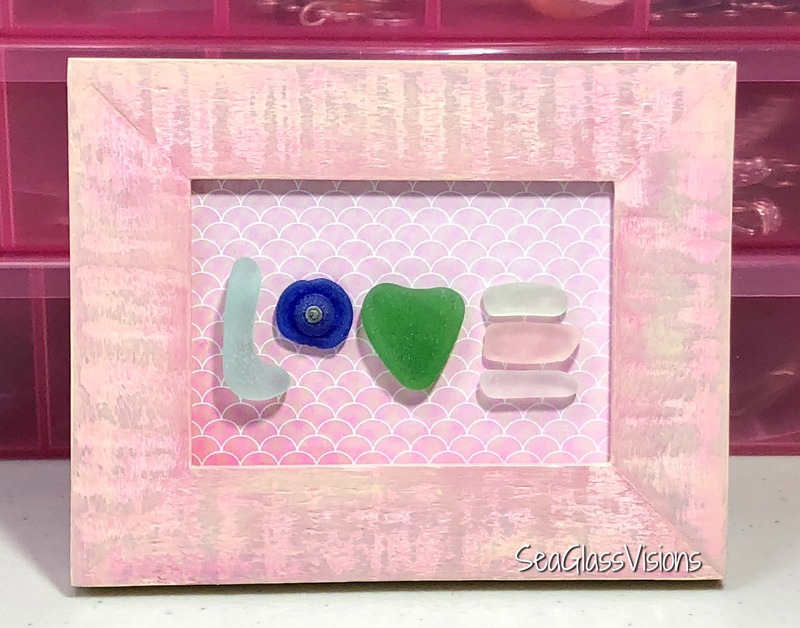 But this happy outcome meant that the background colors I had planned and the sea glass “love” I had chosen needed to be changed out too as the colors I thought I’d use now didn’t work. So, I’m getting ready to head back up to my workroom to start playing again. I still have no idea how this piece will look when it’s completed, and that’s the fun part. OK you guys, it’s February 4th and the pressures on! Just kidding, but, Valentine’s Day is right around the corner and your Sweetheart will be expecting something unique, thoughtful and beautiful. How about a unique one-of-a-kind gift created with sea glass? 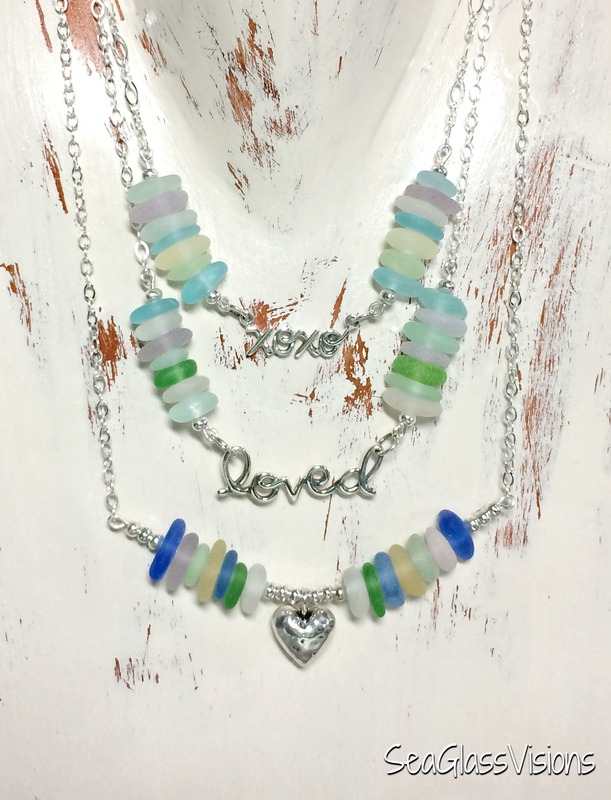 There is no gal out there who wouldn’t love a beautiful piece of sea glass jewelry. 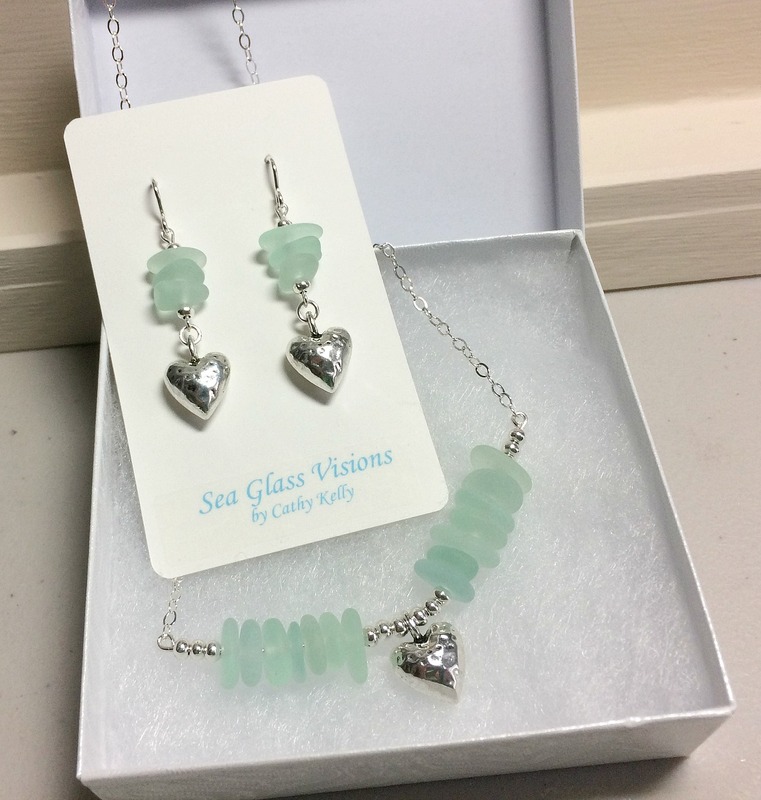 These fabulous sea glass pendant and earring sets are created with jewelry quality sea glass and sterling silver. The beautiful hearts are pewter. They are certainly one-of-a-kind and beautiful! The “xoxo” and “loved” charms are sterling silver, as are the necklaces. All of these pendants and earrings have been created with amazing pastel sea glass handpicked by me in California. These pendants have been best sellers for the Valentine’s Day! 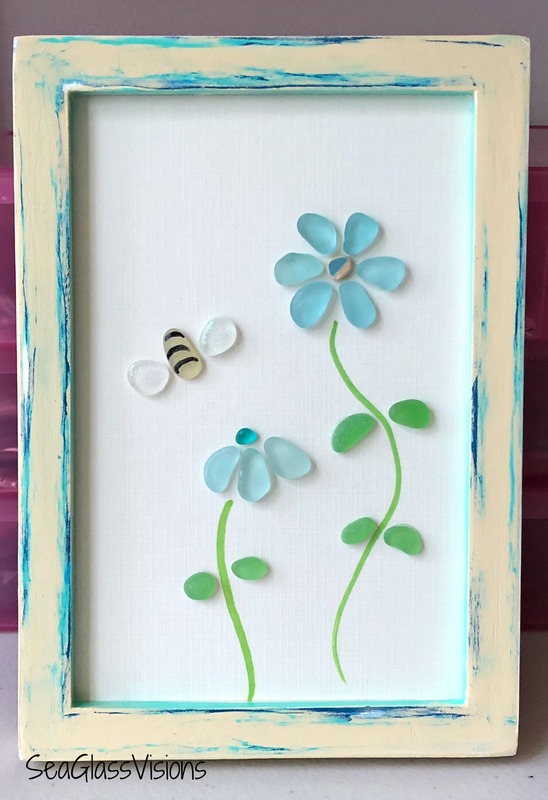 Some of these designs are available locally at two artisan shops, Side Street Framers & Gift Gallery in Severna Park, Maryland and EL & Co. in Pasadena, Maryland. 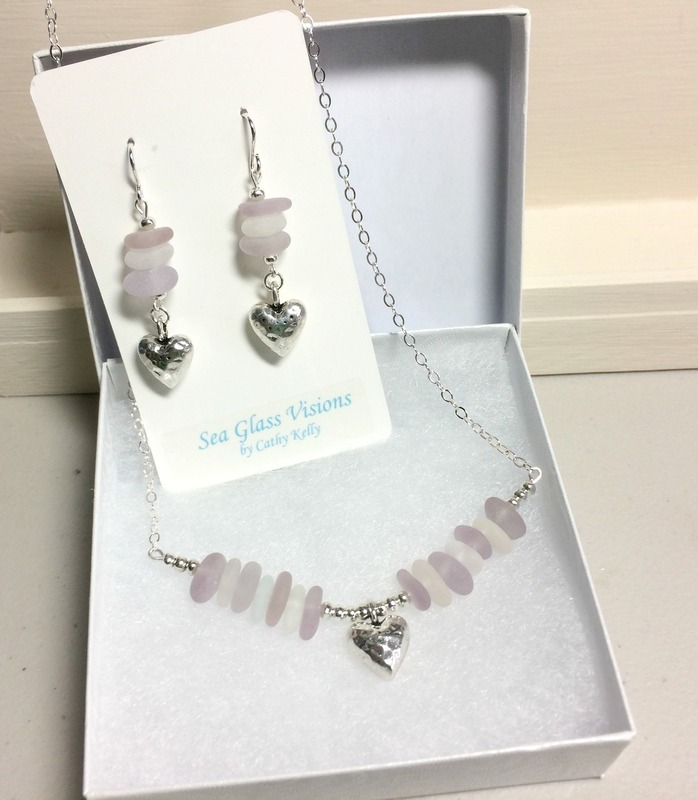 There are more beautiful sea glass jewelry sets, perfect for Valentine’s Day gifts available in my Etsy shop. If there is one absolute perfect, fool-proof, guaranteed to be a hit gift for every pet owner on your list it is this one. 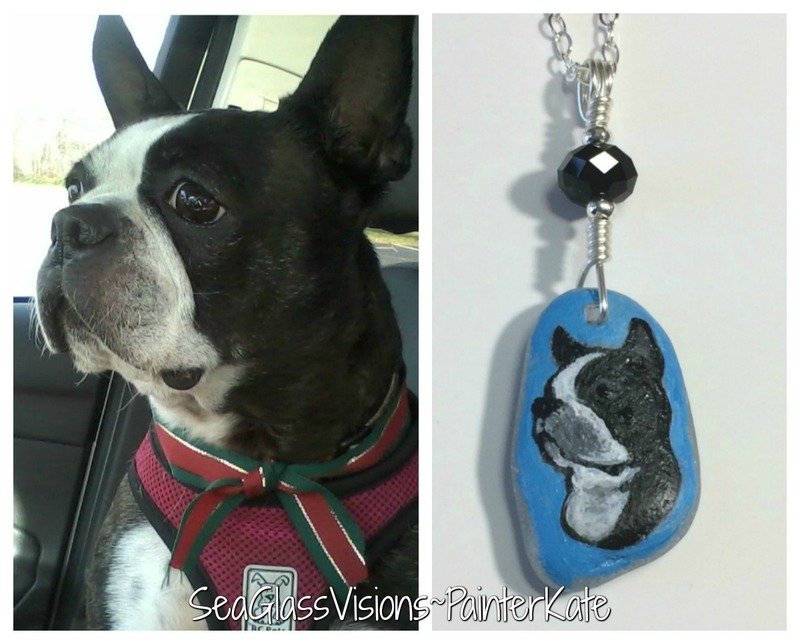 A custom hand painted pet portrait on a genuine sea glass pendant. This is a gift guaranteed to be cherished for a lifetime. Gift recipients have told us there is nothing they cherish more than being able to “keep their baby close” every day! These fabulous keepsake pet portraits hand painted on sea glass are being offered by me and my super talented friend Kate Cocoros aka PainterKate You can read about PainterKate’s fabulous hand painted sea glass here, and you will see her talents have no boundaries. She is able to paint ANY animal, horses, rabbits, goats, cats, dogs, iguanas. ANY animal! We are offering these custom hand painted pet portraits in my Etsy Shop, you can read all the details at this link – SeaGlassVisions. We offer these pendants on jewelry quality California sea glass accented with glass beads and sterling silver. The pendants are ready for you to present in a lovely jewelry box. These are truly one-of-a-kind keepsake gifts! I’ve been creating sea glass jewelry and art for almost six years now and naturally have collected lots and lots of beads along the way. 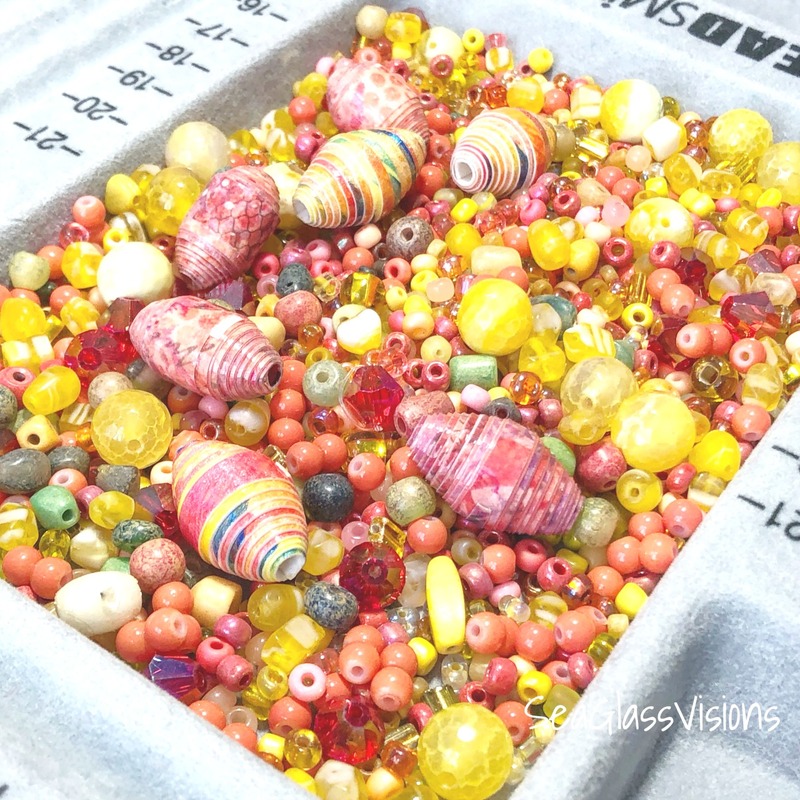 I’ve purchased beads at bead shows, at Michael’s and A.C. Moore, at bead shops in Colorado, New Hampshire, Vermont and Maryland, purchased online from a variety of sources and have purchased finished jewelry items to re-purpose the beads. I now have twenty full bead boxes full of fun and colorful beads. I decided that one of my New Year resolutions should be using beads I haven’t used in a long time. Since the New Year I have been focusing on creating sea glass jewelry sets, so I decided to combined the two and create new sea glass pendant and earring sets along with beads I haven’t used in a long time. I’m thrilled with the results! The beads I used were from a finished piece of jewelry. The fabulous cornflower blue sea glass is from California. The green set earrings are created with sea glass from California and the pendant is sea glass from the Bahamas that was found by a friend.